We are very fortunate at Holy Innocents' Catholic Primary School to have such close links with the parish of Holy Innocents' which is just over the road from the school. Pupils and staff attend Mass at the Church at the start and end of term and on Holy Days of Obligation. Parents and Parishioners are always welcome to join us in these celebrations. The history of Holy Innocents are the education of young people goes back a very long way. Holy Innocents' school was originally called St. Anne's Primary School established in 1954. Before that, St. Anne's was an orphanage for girls. Another orphanage for boys called St. Joseph's stood on the other side of the original Holy Innocents Chapel which stood roughly where the school car park is today. Today, Holy Innocents' is a vibrant parish and we are very fortunate to have excellent links. To find out more visit their website. Holy Innocents’ School – “Going from strength to strength” We are fortunate to have many teachers, staff and pupils from a range of schools in our Holy Innocents’ community. But of course Holy Innocents School has a special place in the life of the parish. Many parishioners support the School in different ways. We asked two of them, along with headteacher Mr Ryan Langford, to give us a mid-term “school report”. “Under Ryan’s excellent and caring leadership, Holy Innocents’ School continues to go from strength to strength,” said chair of governors Ian Wilson. “This is reflected in a considerable increase in the numbers of applications for places. Academically children do well, with many obtaining grammar school places at the end of year six. A strong emphasis is also placed on children’s personal, social and spiritual development, an area which was highly praised in the school’s last Ofsted inspection.” Marcus Warner became a Foundation Governor last year. “The thing that has struck me most,” he reflected, “is the deep sense of community at the school. The pupils and staff all know each other really well and each child is treated and supported as an individual. External visitors to the school consistently comment on the politeness, behaviour and attitude of the children.” He also highlighted the school’s rich cultural diversity. “This was notable in particular last summer, with a week of events that celebrated the wide variety of foods, clothes and traditions within the school community”. Monsignor Matthew Dickens, the Vicar General, recently visited to approve the tabernacle newly-installed in the school chapel. Mr Langford told us that the tabernacle was installed to enable pupils to access adoration sessions more regularly. “We hope to be able to hold a school Mass in the near future where the Blessed Sacrament will be reserved for the first time.” This is not the only way in which the children are leading us by example. They are also raising money for CAFOD this Lent. And they have their own "Live Simply" initiatives, entirely conceived and coordinated by the school’s environmental prefects. These include looking at reducing food waste, regular litter picking and reducing single use plastic. Finally, we mustn’t forget Holy Innocents’ preschool. “The pre-school children and staff have settled in really well,” Marcus told us. “They are integrated into the rest of the school. This was demonstrated at the recent Ash Wednesday liturgy led by Deacon Barry where they participated and received the ashes along with the rest of the school pupils and staff.” As you will see from the flyer attached to this newsletter, the preschool is now taking applications for April and September.Holy Innocents’ School – “Going from strength to strength” We are fortunate to have many teachers, staff and pupils from a range of schools in our Holy Innocents’ community. But of course Holy Innocents School has a special place in the life of the parish. Many parishioners support the School in different ways. We asked two of them, along with headteacher Mr Ryan Langford, to give us a mid-term “school report”. “Under Ryan’s excellent and caring leadership, Holy Innocents’ School continues to go from strength to strength,” said chair of governors Ian Wilson. “This is reflected in a considerable increase in the numbers of applications for places. Academically children do well, with many obtaining grammar school places at the end of year six. A strong emphasis is also placed on children’s personal, social and spiritual development, an area which was highly praised in the school’s last Ofsted inspection.” Marcus Warner became a Foundation Governor last year. “The thing that has struck me most,” he reflected, “is the deep sense of community at the school. The pupils and staff all know each other really well and each child is treated and supported as an individual. External visitors to the school consistently comment on the politeness, behaviour and attitude of the children.” He also highlighted the school’s rich cultural diversity. “This was notable in particular last summer, with a week of events that celebrated the wide variety of foods, clothes and traditions within the school community”. Monsignor Matthew Dickens, the Vicar General, recently visited to approve the tabernacle newly-installed in the school chapel. Mr Langford told us that the tabernacle was installed to enable pupils to access adoration sessions more regularly. “We hope to be able to hold a school Mass in the near future where the Blessed Sacrament will be reserved for the first time.” This is not the only way in which the children are leading us by example. They are also raising money for CAFOD this Lent. And they have their own "Live Simply" initiatives, entirely conceived and coordinated by the school’s environmental prefects. These include looking at reducing food waste, regular litter picking and reducing single use plastic. Finally, we mustn’t forget Holy Innocents’ preschool. “The pre-school children and staff have settled in really well,” Marcus told us. “They are integrated into the rest of the school. This was demonstrated at the recent Ash Wednesday liturgy led by Deacon Barry where they participated and received the ashes along with the rest of the school pupils and staff.” As you will see from the flyer attached to this newsletter, the preschool is now taking applications for April and September.Holy Innocents’ School – “Going from strength to strength” We are fortunate to have many teachers, staff and pupils from a range of schools in our Holy Innocents’ community. But of course Holy Innocents School has a special place in the life of the parish. Many parishioners support the School in different ways. We asked two of them, along with headteacher Mr Ryan Langford, to give us a mid-term “school report”. “Under Ryan’s excellent and caring leadership, Holy Innocents’ School continues to go from strength to strength,” said chair of governors Ian Wilson. “This is reflected in a considerable increase in the numbers of applications for places. Academically children do well, with many obtaining grammar school places at the end of year six. A strong emphasis is also placed on children’s personal, social and spiritual development, an area which was highly praised in the school’s last Ofsted inspection.” Marcus Warner became a Foundation Governor last year. “The thing that has struck me most,” he reflected, “is the deep sense of community at the school. The pupils and staff all know each other really well and each child is treated and supported as an individual. External visitors to the school consistently comment on the politeness, behaviour and attitude of the children.” He also highlighted the school’s rich cultural diversity. “This was notable in particular last summer, with a week of events that celebrated the wide variety of foods, clothes and traditions within the school community”. Monsignor Matthew Dickens, the Vicar General, recently visited to approve the tabernacle newly-installed in the school chapel. Mr Langford told us that the tabernacle was installed to enable pupils to access adoration sessions more regularly. “We hope to be able to hold a school Mass in the near future where the Blessed Sacrament will be reserved for the first time.” This is not the only way in which the children are leading us by example. They are also raising money for CAFOD this Lent. And they have their own "Live Simply" initiatives, entirely conceived and coordinated by the school’s environmental prefects. These include looking at reducing food waste, regular litter picking and reducing single use plastic. Finally, we mustn’t forget Holy Innocents’ preschool. “The pre-school children and staff have settled in really well,” Marcus told us. “They are integrated into the rest of the school. This was demonstrated at the recent Ash Wednesday liturgy led by Deacon Barry where they participated and received the ashes along with the rest of the school pupils and staff.” As you will see from the flyer attached to this newsletter, the preschool is now taking applications for April and September. The site on which the church is built was part of a 60 acre estate bought in 1891 by the diocese to build orphanages for local children. St. Joseph’s and St Anne’s orphanages were built in 1893 to house and educate orphans and homeless children from Southeast London. There were 120 boys and 146 girls living at these premises. 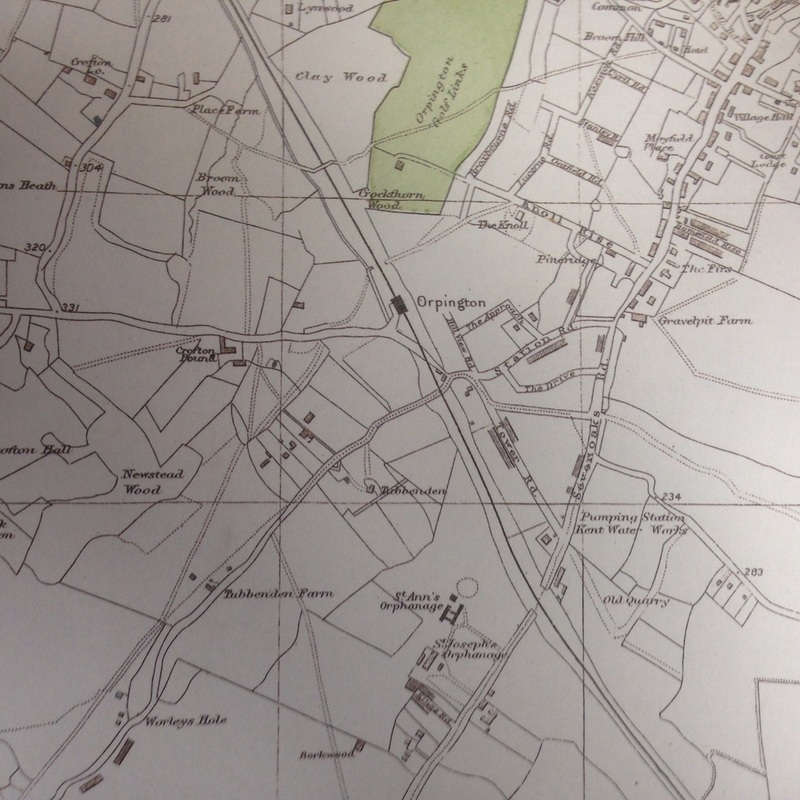 Although there had been a railway station at Orpington since 1868, the area was largely rural at that time as the map below shows. St. Mary’s Cray was the largest village in the area and the first railway station was built there in 1860.The only place of worship was at St. Mary’s at the Chislehurst Mission which had existed since 1852. Mass was celebrated in St. Mary’s Cray since 1873 in the local school, and in 1875 had its first resident priest. The parish bought three cottages at the junction of the High Street and Blacksmiths Lane and St. Joseph's Church (now, Our Lady of the Crays ) was built next to the school. As ​prosperity grew in post-war England and social attitudes changed, the need for orphanages declined and in 1954 St Anne’s orphanage becomes a primary school and St Joseph’s a secondary school. In 1907 the wealthy philanthropist, Miss Frances Elizabeth Ellis, provided the funds for a chapel to be built in Orpington and in 1909 Holy Innocents' chapel opened on a site between the two orphanages. 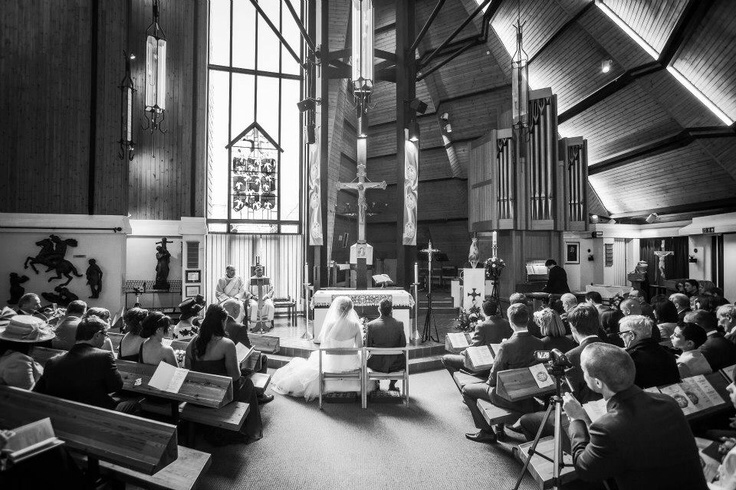 The chapel served the residents of Orpington and with continued population growth in Orpington, the congregation increased and the chapel finally became the Catholic Parish Church in 1971. 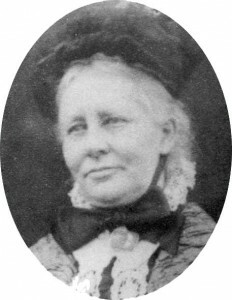 ​Frances Ellis was born into a wealthy family in Brighton in 1846 and raised as an Anglican. She was left a considerable fortune by her father, and devoted much of her adult life to caring for her blind mother and infirm sister. During the 1890’s, Miss Ellis began to buy sites and give money to found new churches in the Southwark diocese. Although few records remain, her method seems to have been to find a core group of the faithful in a “frontier” area, and then to work with them and with the diocese to establish a new church. Miss Ellis herself generally bought the sites, as well as giving generously to the construction. The prospective parishioners also contributed, as did the diocese. Financial provision was made in every case for a presbytery, but never for a school. Miss Ellis was instrumental in setting up at least 22 churches in South London and others elsewhere in the southeast of England, including Abbey Wood, Bermondsey, Brixton, Carshalton, Catford, Charlton, Clapham, Earlsfield, Forest Hill, Herne Hill, Kennington, Norbury, Norwood, Nunhead, Orpington, Peckham, Stockwell, Streatham, Tooting and Wallington. In 1978, the land on which the orphanages and the original Holy Innocents Church stood was found to be suffering from serious subsidence and the closure of the buildings became necessary. The land was redeveloped as St Joseph's Estate and some of the new roads were named after prominent sisters and brothers associated with the old orphanages. A decision was made to rebuild the church. A competition was held to choose a design for the new church, parish centre and presbytery, under the auspices of the Royal Institute of British Architects. Six entries were received, and early in 1979, the winner was announced as architect Michael Blee Whittaker Partnership. The architects described the design as ‘a facetted random helix’, with overlapping roofs around a central cluster of columns, the ‘axis mundi’. The church was surrounded by ancillary spaces at the west, with the presbytery and the parish centre forming a three-sided courtyard at the east. 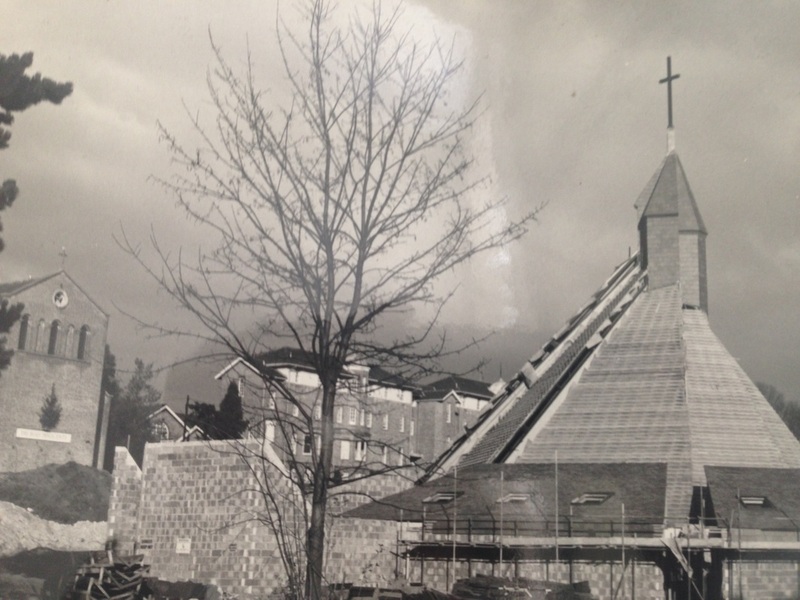 On 11 May 1980, Archbishop Bowen laid the foundation stone in the form of a slate plinth for the tabernacle stand. In October 1980, the 4 metre high terminal cross was blessed and then raised to its position. On 3 August 1981, an inscribed slate stone was placed south of the west entrance, commemorating the completion of the church. The cost of the contract was £537,320. The bell from the old chapel was installed in the belfry. The burials in the orphanages’ private cemetery for children, priests, brothers, sisters, staff and some parishioners were reinterred in the garden of the new church, with a single large memorial. Holy Innocents' Roman Catholic Church was both consecrated and opened on the same day, 20 September 1981, with Archbishop Michael Bowen conducting the ceremony. In his sermon, the Archbishop remarked that it was the ambition of every parish priest to build a new church and he congratulated Father Michael Phelan on achieving this aim. The church and roof are covered in Westmorland slate. The church is roughly a semicircle and around the circumference are ancillary spaces in low, lean-to blocks, surrounding the central steeply pitched roof. 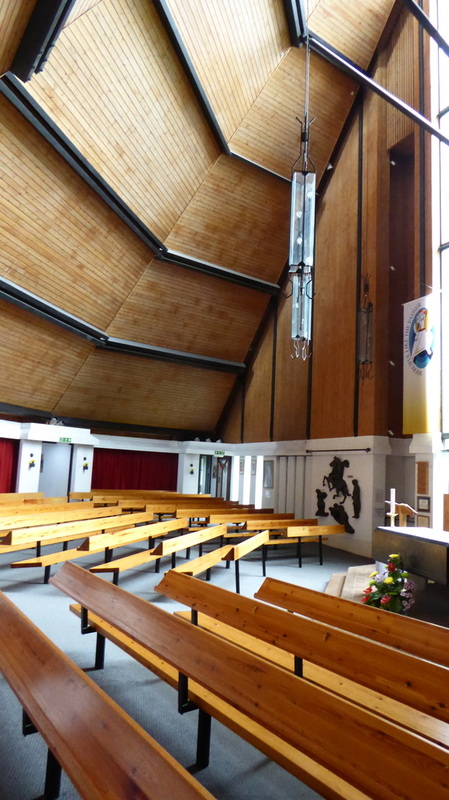 The worship space is ringed by three halls named St Joseph’s, Our Lady of Mercy, and Trinity. The Stations of the Cross, painted rectangular casts recessed into the walls, are located throughout the building. The roof structure is seven-sided, each side overlapping with the next with a narrow window in between them. Panelled in timber, the roof sections centre on a central cluster of timber columns, the so-called ‘axis mundi’. North of the sanctuary on the east wall is a three-part bronze sculpture group of the Massacre of the Holy Innocents by parishioner Nesta McGavin. Just to the right is a shallow niche with a statue of the Virgin with the Child beside the east window. The altar is a solid block of Cumbrian slate weighing about two tons, and it is set on a small pedestal clad in the same material. 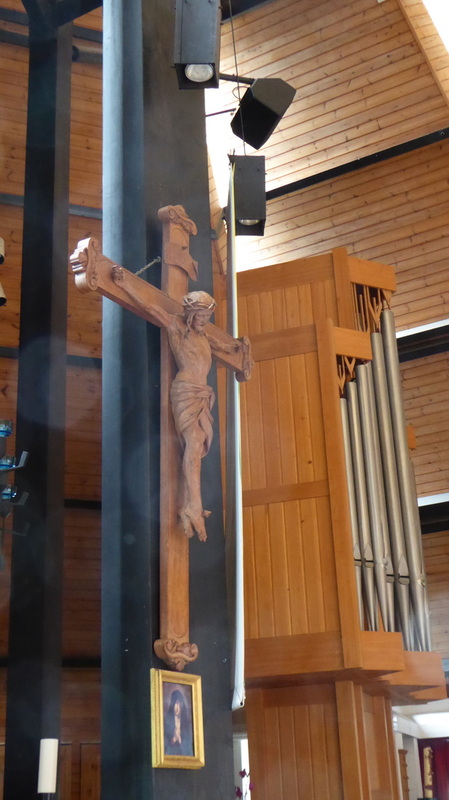 Behind the altar hangs a large timber crucifix which was retained from the old church. Behind the Altar is the Unity Chapel containing the tabernacle which is set inside the ring of central columns, with an iron chandelier above. It is set on a black slate stone on top of a tiled pedestal. The slate is engraved with the inscription: ‘Love one another, as I have loved you. This stone was laid by Archbishop Michael Bowen on Sunday May 11, 1981. Iron and glass lanterns are suspended from the roof throughout the worship space. The stained glass window is a permanent memorial, chosen by parishioners to honour Father Michael Phelan. The design shows the Holy Innocents as birds flying to the Cross. There is an explanation of the memorial by the artist Margaret Traherne, an internationally recognised stained glass window designer, on the column to the left of the window. Just below it is the Peace Window, a panel with the words ‘Pax Tecum’, designed by Hugh Wootton. The organ was specially designed for the new church by Herr Spath of West Germany. It is a two-manual tracker action pipe organ, and is particularly suited for the music of the period of J S Bach. It is perfect for the accompaniment of congregational singing, which it supports but cannot drown. In June 1981 the clergy moved into the new presbytery. However, within a month, watermarks appeared on the walls. A series of remedial works followed for over 20 years, without rectifying the problems of damp and water ingress. A new presbytery in a sympathetic style was built at the east corner of the complex and was occupied by December 2000. Father Michael Phelan attended St John’s seminary in Wonersh, Surrey in 1932 and was ordained in 1938. He served as curate at Morden for a short time until appointed assistant to Father Healy at the Rescue Society. After the end of the war Father Phelan was moved to Worthing where he served as curate until 1955 when he was appointed Priest in Charge at Holy Innocents'. With Mr Bingham Towner as architect, he built a new Presbytery at the far side of the car park behind the church which, when the land at Orpington was later sold by the Diocese, was purchased by the Sisters of Mercy and is now St Anne's Convent. Canon John McNamara was appointed Parish Priest of Holy Innocents' by Archbishop Michael Bowen in 1984 to succeed Father Michael Phelan. He wrote about his own time in the parish: "The first concern was to clear the debt on the recently built new church. The response from parishioners was remarkable and it was cleared within about three years. We soon instituted lay ministers of Holy Communion to be followed latterly by the ordination of two married Deacons, the Reverends Austin Martin and James Burleigh. We also recruited a team of hospital visitors who were most helpful and popular with patients. There was, and still is, a vibrant sense of openness and community in the congregation." Sadly Canon John had to relinquish his role due to ill health, but he now lives in the parish and remains a much-loved and respected member of our parish community. Canon John Watts was ordained in the parish of Our Lady of the Annunciation, Addiscombe, in 1972. His first two curacies were at Whitstable and Camberwell. In 1978 he was appointed to St. John's Seminary, Wonersh where he taught for the next thirteen years. In 1991 he was appointed Parish Priest to Holy Innocents’, Orpington. The following year he became the Director of the Permanent Diaconate Programme for the Diocese. This is a post he held until June 2004. In November 2004 Archbishop MacDonald appointed him Dean of the Bromley Deanery. He also served on the Chapter of Canons, as Canon Penitentiary; he was the Chairman of the Council of Priests and an Advocate of the Southwark Tribunal.